We are sending you this information out of concern. Concern for your financial well being and concern for the reputations of our hard working Republican legislators. Extreme liberal special interest groups have been working covertly to shut down Maine government, and then blame Republicans for it. We want to arm you with the facts, and inform you of the very real repercussions you will feel if liberal special interest groups get their way. As you can see, Democrats proudly made the shutdown threat, urged on by liberal political operatives named below. Phil Bartlett (Maine Democratic Party)- Liberal legislator from the failed Baldacci-era of massive budget shortfalls, blew $6.3 million Maine Democratic Party dollars, much of it on attack ads, while losing elections across the state in 2016. Adam Goode (Maine AFL-CIO)- Ethically challenged liberal lawmaker last year, ethically challenged revolving door union lobbyist this year. Mike Tipping (Maine People’s Alliance) – political flack for org that hires criminals and pedophiles and funds passage of unconstitutional and destructive laws. John Kosinski (MEA)- Lobbyist for Maine Teacher’s Union, head of million dollar extreme liberal PAC. This weekend while you were observing Memorial Day, the vultures that surround the Maine Legislature were working overtime to build a narrative that Republicans are trying to ‘shut down’ state government. Here is the truth – some extreme liberal Democrats are the ones pushing a false choice between massive spending increases or a government shutdown. More than 50 Democrats in the Legislature signed a letter promising to shut down state government if they don’t get the record-breaking spending spree they want. 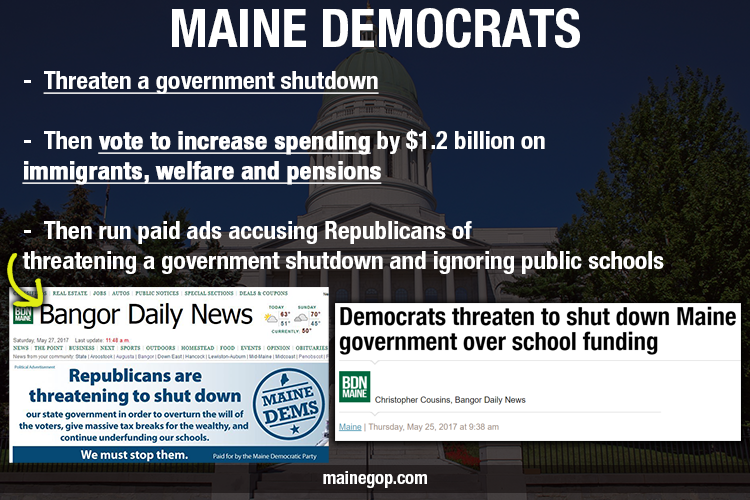 – The Maine Democratic Party ran ads this weekend accusing Republicans of wanting a shutdown and ignoring public school funding – immediately after THEY threatened a shutdown and voted for $1.2 billion in new spending on ‘ethnicity-based community organizations’, welfare programs and state pension increases, NOT our schools! – Liberal special interest groups kicked into gear, pushing all sorts of social media messaging accusing Republicans of wanting a shutdown. – They even ran a push-poll across the state to test shutdown messaging blaming Republicans. Right now, as it stands, it’s looking like extreme liberals and their special interest group backers have already made up their mind to shut down state government if they don’t get the welfare funding increase they want. Even while leadership in both parties are working to negotiate a budget deal – these extreme left-wing groups and operatives are trying to undermine the state and push for a massive spending increase. We ran the numbers, and it is scary. To pay for this kind of spending increase, we would be looking at a sales tax of over 8.5%, or income tax increases of $400 to $2,800 for households earning $35k-$132k per year. Imagine your sales tax being 8.5%, or every middle-income Maine family paying an income tax above 10%. That is where they want to take us. 1) Notify us if you receive one of these liberal group’s push poll calls. Listen for who paid for the call and try to write down the questions. 2) Let us know if you see any advertising on social media or on news sites. If it has a link send us the URL. Email us at contact@mainegop.com if you spot any of the above.